The South Portland High baseball team already was going to have a big advantage whenever 6-foot-5 junior left-hander Hunter Owen took the mound. All he did as a sophomore was win SMAA pitcher and player of the year honors before receiving a scholarship offer from Vanderbilt, an NCAA Division I power. Then Noah Lewis developed so rapidly that he went from a sophomore shortstop who “was just worried about making varsity” into a junior right-hander with mid-80s gas. Now South Portland has a second pitcher with a scholarship offer from a Division I school. Lewis has committed to the University of Maine. The Red Riots’ lefty-righty combo will translate into lots of tough at-bats for Class A opponents the next two seasons. “Any time you have two Division I pitchers in our league, that puts you in position to be very competitive,” said Gorham Coach Chuck Nadeau. Both players have improved since last season, according to South Portland Coach Mike Owens. Instead of relaxing after making their college choices, Owen and Lewis have sharpened their focus and increased their training. The pitchers’ success and commitment to improve is resonating throughout the program. Coach Owens noted that before one practice last week he had 31 players taking part in a weight-room session. “It’s no coincidence that baseball is cool again in South Portland. I think (Owen and Lewis) had something to do with it,” he said. Owen enters the season as South Portland’s clear No. 1 starter. Prep Baseball Report ranks him as the top Class of 2020 player in New England. As a sophomore, Owen was 6-1 with a 1.25 ERA and 65 strikeouts in 39 innings. When his fastball touched 90 mph over the summer, Vanderbilt Coach Tim Corbin offered him a scholarship. Owens said his star pitcher has been contacted by pro scouts and sports agents angling to serve in an advisory role. Lewis is more serious and subdued in conversation. He understands he’s the staff’s No. 2 pitcher, and his challenge this season will be to show he can build on his solid sophomore season (3-1 record, 1.10 ERA, 24 strikeouts in 25 1/3 innings) and carry more of a load against the top Class A opponents. “I expect him to burst on the scene this year,” Owens said. South Portland is replacing up to seven position players from a club that went 14-2 in the regular season but lost to Falmouth 4-2 in the Class A South quarterfinals. Owen struck out nine over five innings but walked five. 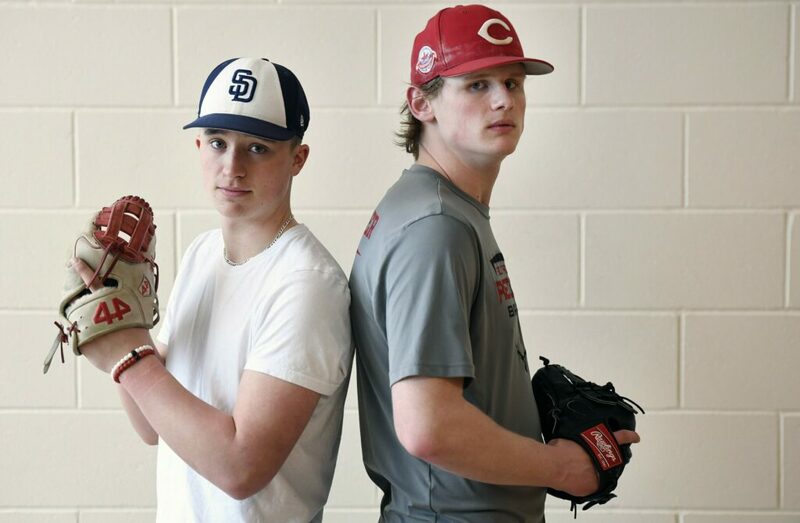 Lewis and Owen are both intent on the team goal – the Red Riots’ first baseball state championship since 1952. “We have talks about pushing each other and pushing the team more, and just to keep ourselves to a really high standard,” Lewis said. “The thing about our team is we’ve got very low egos so everyone is here for one goal, and obviously the goal for a team is to win a state championship,” Owen said.